Beautiful certificate from the Edison Phonograph Distributing Company issued in 1925. 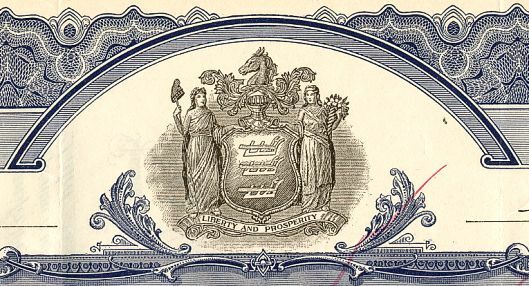 This historic document was printed by Broun-Green Banknote Company and has an ornate border around it with a vignette of two allegorical women next to a seal (New Jersey State Seal). This item has the signatures of the Company's President, Charles Edison and Treasurer, H. F. Miller and is over 83 years old. The certificate was issued to Henry Lanahan and signed by him on the back along with Henry Miller. The Edison Phonograph Distributing Company merged with Edison Phonographs, Ltd. on July 15, 1925. The Edison Phonograph Distributing Company name was changed to the Edison Distributing Corporation on August 28, 1928. The company was controlled by Thomas A. Edison Inc. 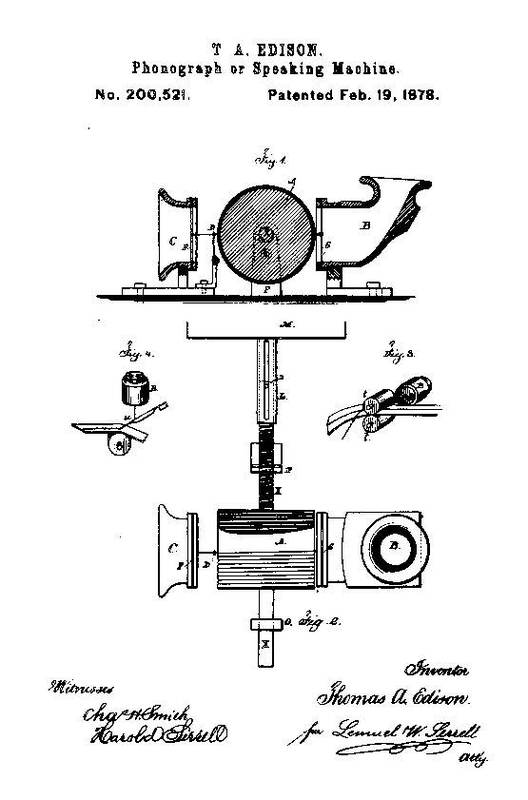 The Edison Phonograph Works, incorporated on May 3, 1888, held the manufacturing rights for Edison's phonograph. Edison was the company's founding president and majority stockholder. 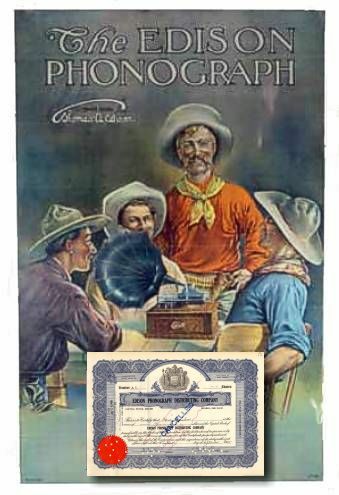 During the 1890s the EPW operated a factory in Orange, New Jersey, at which it manufactured phonographs and cylinders for the North American Phonograph Co., the National Phonograph Co., and the International Graphophone Co. It also produced machines for the Bates Manufacturing Co. and electrical devices for the Edison Manufacturing Works. In 1914 its factory was destroyed by fire. In 1924 the company became part of Thomas A. Edison Inc.
Charles Edison was born at Glenmont on August 3, 1890 at Glenmont. Charles graduated from the Hotchkiss School in Lakeville, Connecticut. He married his college sweetheart, Carolyn Hawkins, at his parents' winter home in Fort Myers, Florida, March 27, 1918. He became president of his father's company, Thomas A. Edison, Incorporated, in 1927. He ran the company until it was sold in 1959. Charles is the best known of the Edison children because of his second career, in public service. In the mid-1930s he served in the cabinet of President Franklin Roosevelt--first as Assistant Secretary of the Navy, then as Acting Secretary. New Jersey voters elected him as their governor in 1940, but Charles broke a family tradition in the process--he ran as a Democrat. He proposed an updated state constitution for the state, but voters rejected it in a statewide referendum. However, his work inspired later New Jersey legislators to pass a modern constitution after Edison's governorship. He also founded a charitable foundation that now bears his name, the Charles Edison Fund. He died on July 31, 1969 only a few weeks after man first landed on the moon. Henry Lanahan was the General Counsel for Thomas Edison and his companies. In May of 1913, it was decided by a survey of independent magazine readers that Thomas A. Edison was the most useful man in the country. Although Edison was born on February 11th, 1847, the impact of his accomplishments are still being felt over a century later. When he was a young boy, doctors feared that he might be brain damaged because of the size of his head. However, by 1869, this odd young man named Thomas Alva Edison had become a full time inventor. In addition to inventing the phonograph, incandescent light bulbs, and motion picture camera, Edison established over 1,093 patents earning him the nickname "The Wizard of Menlo Park." On April 24, 1889 the Edison General Electric Company was organized. In December of 1903, The Edison Manufacturing Company released its hit film, The Great Train Robbery, directed by Edwin S. Porter. On May 21st, 1928 Edison received an honorary medal from Congress. Three years later, on January 6th, 1931, Thomas Edison filed his last patent application. He died in November of that same year. Thomas Alva Edison will be remembered as one of the most prolific inventors of all time. His patents and discoveries cover a multitude of subjects, including: electric lighting, electric railways, secondary batteries, phonographs, cylinder records, and much more. These inventions have made a significant impact on how science and invention have progressed in the century following this amazing man's life. Harry F. Miller was scheduled to start work for Thomas A. Edison on March 11, 1888 but a blizzard prevented his arrival. He made it the next day, and began work as an assistant to John F. Randolph, bookkeeper. He may also have served as office manager for the Edison Manufacturing Company in Silver Lake, New Jersey. From 1896 to 1908 he was the cashier for the National Phonograph Company. When John F. Randolph died in 1908, Miller took his place as private secretary to Edison and assistant treasurer for the Edison Phonograph Works, the National Phonograph Company, the Edison Manufacturing Company and the Bates Manufacturing Company. In 1910, William H. Meadowcroft became Edison's private secretary, but the records indicate that Miller continued to act as assistant treasurer for the various Edison companies and, in some capacity, as secretary, until 1916. In 1916, Miller succeeded Ernest J. Berggren as treasurer of Thomas A. Edison, Inc. and Edison manufacturing Company. He later became treasurer and director of Thomas A. Edison, Inc., Edison Portland Cement Company and affiliated Companies. He maintained these responsibilities until his retirement on January 1, 1937.